It’s the week of la rentrée, going back to school – or uni. And in the tradition of ladies first, Caiti is the first to leave Les Fragnes for an educational establishment. We’re here in Bordeaux, in the Formule 1 hotel in Villenave, all ready to deliver her to her flat tomorrow. We drove down this afternoon, found the hotel and then had a rather nice tea at the very convenient Buffalo Grill next door. 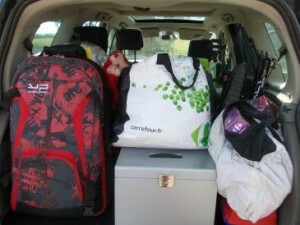 Caits had been packing in a rather unhurried fashion over the last week but we finally got her focussed and by lunchtime Sunday the car was loaded up. Chris reckons we had less stuff than this between us when he and I moved into our first house together all those years ago, but I think he’s exaggerating – slightly! She actually hasn’t gone too mad. 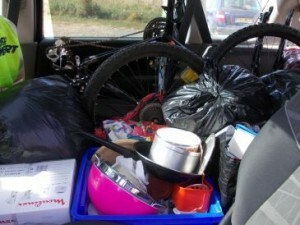 The bike and bedding take up quite a lot of space, and the cooking equipment. Caiti is an enthusiastic cook. We’ve left the boys holding the fort at Les Fragnes. The latest report is that all the animals have been fed and watered for the night, themselves included, so all is well. And to finish a photo of Ruadhri’s car, which he’s very keen to share with the world and this is as good a blog post as any to include it in. 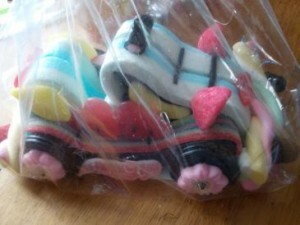 It’s made of sweets and was given to him this week. I don’t suppose it will last much longer!